Having officially reached lunar orbit on June 23rd, 2009, the Lunar Reconnaissance Orbiter (LRO) has now marked one full year on its mission to scout the moon. Maps and datasets collected by LRO’s state-of-the-art instruments will form the foundation for all future lunar exploration plans, as well as be critical to scientists working to better understand the moon and its environment. In only the first year of the mission, LRO has gathered more digital information than any previous planetary mission in history. To celebrate one year in orbit, here are ten cool things already observed by LRO. Note that the stories here are just a small sample of what the LRO team has released and barely touch on the major scientific accomplishments of the mission. 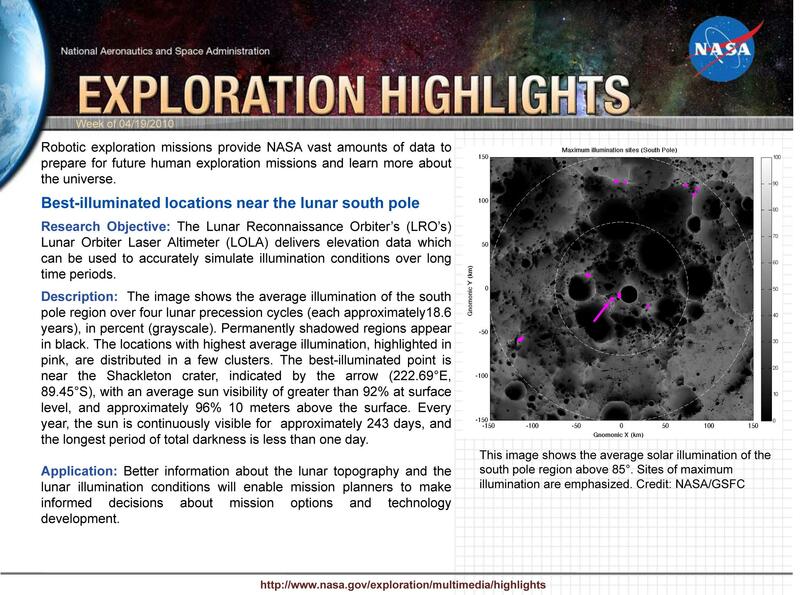 If you like these, visit the official LRO web site at www.nasa.gov/LRO to find out even more!